Get the benefits of SAP’s proven global payroll solution — in the cloud. 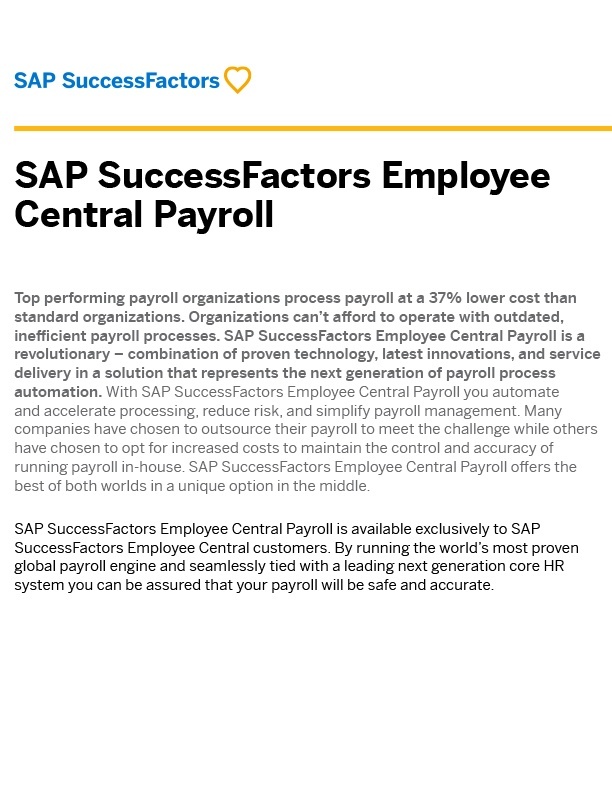 SAP SuccessFactors Employee Central Payroll offers all the same features and benefits as SAP's on-premise payroll solution, but it is delivered with the security, scale, and flexibility of the cloud. A proven solution – Based on the world's leading-edge payroll solution, it is currently used by thousands of organizations worldwide. Global reach – Employee Central Payroll is available today for 37 countries. Choice – Available for customers who want the benefits and convenience of cloud delivery but who also want the control of implementing and managing payroll in-house. Lower TCO – Realize the significant cost advantages of a cloud-based solution. Compliance – Employee Central Payroll delivers legal compliance and best practices. Our dedicated specialists and country-specific product managers stay on top of local statutes.